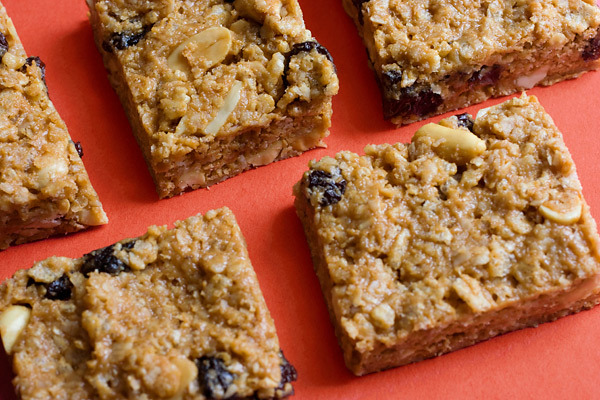 Granola bars are an excellent snack. They’re portable, tasty and packed full of energy. But packaged granola bars are expensive and have unnecessary fillers. I’ve never made my own until I got a hold of the first jar of Peanut Butter Boy and realized that I needed a portable way to consume it. A little research and experimenting led me to create this recipe, which is not only gluten-free but also no-bake. These bars stay good in the refrigerator for a long time, and will last in the freezer until the end of time (or until freezer burn sets in). 1. Place peanut butter and honey into a small, microwave-safe bowl. Mix together, then microwave on high until the mixture is warm and easy to stir (20-30 seconds). 2. Now mix all ingredients together in a large bowl. 3. Press into a sprayed 9×13 pan. Refrigerate for 1 hour. Cut into 20 pieces. Chuck – Why weren’t you around when I made this recipe a second and third time? What the heck! Now I have to make it again. These look amazing. Just waiting for the right PB! Yum! Off to order your pb right now (finally). I’m going to try something similar to this with dried banana chips. I noticed you don’t roast your oats is there a reason behind not doing it? Hmm, I never thought to roast the oats first actually. I imagine it improves the flavor quite a bit? I think it opens up there flavor quite a bit, I do 16 oz of oats on a pan in 375 oven for 15 to 20 mins. just lightly toast them, if you can smell the oats in the air there done. To be honest with a lot of nuts and grains will benefit from a pre-roast in the oven(unless the store sells them roasted of coarse). Keep up the blog! 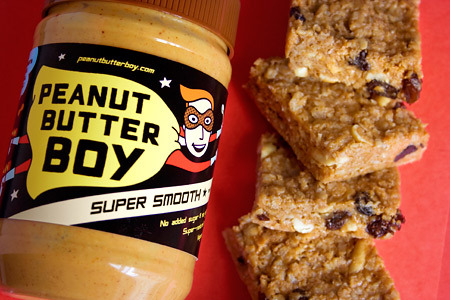 your peanut butter looks delicious :). Great idea – I’ll give that a shot, thanks!